Founded Acquired by the Jambon-Chanrion family in 1861. Paul Jambon started in 1987. Mont Brouilly rises to a height of 1,587 feet all by its lonesome, an old volcanic thumb sticking out of a plain. Paul Jambon grew up in the shadow of this geological skyscraper—the first one encountered as you drive west from the River Saône into this southern sector of the Haut Beaujolais. Mont Brouilly marks the beginning of the Beaujolais hills. The Romans cultivated vines on its flanks, and almost certainly vines to one degree or another have been raised on its steep sides ever since. Its crown is forested, much like the crown of Corton along the Côte d’Or. The summit was once part of Jambon’s Domaine du Pavillon du Chavannes and was donated for the construction of the Chapel of our Lady of Brouilly, built to celebrate the victory over downy mildew (a fungus which wreaked havoc in Europe’s vineyards upon the heels of phylloxera—both American exports, along with those other two vine scourges, black rot and powdery mildew, or oidium). Pavillon du Chavannes with its vineyards high on the western flank of Mont Brouilly. Philip the Bold issued his famous 14th century edict banning Gamay from the Côte d’Or and limiting it to Beaujolais with good reason—the grape makes far better wine growing in the Haut Beaujolais’ granite hillsides than it does in the Côte d’Or’s limestone escarpment (limestone Gamay is usually rustic stuff). But of course not all granite is equal, and Mont Brouilly’s “blue” granite is laced with volcanic porphyry, or crystallized mineral deposits. 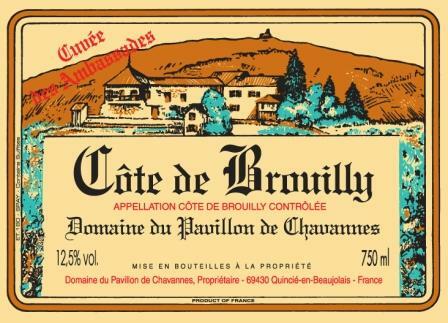 This mixture, combined with the elevation (AOC Côte de Brouilly is confined to the upper, better ripening vineyards; AOC Brouilly is lower, and, as the biggest of the Beaujolais crus, far larger), accounts for Côte de Brouilly’s highly scented and finely—fine is the adjective that comes to mind—concentrated wines. This profile is particularly apparent in the wines of Pavillon du Chavannes because its vineyards are the highest and the steepest in this elevated appellation. It helps too that winemaking at this domain is traditional and simple, with little extraction in the modern sense (Pavillon’s wine could well be labeled the antithesis of modern extracted power). The alcoholic fermentation is done in concrete vats, and until the 2015 vintage the wine was racked into old foudres for aging. Nowadays, it’s racked into steel. Pavillon du Chavannes was acquired by the Jambon-Chanrion family in 1861. Its history became intertwined with that of Château Thivin when Yvonne Chanrion married Claude Geoffray shortly after the First World War. Claude had inherited Thivin, then a small estate. Yvonne took with her one-third of her family’s highly regarded vineyards as an inheritance, and later she acquired her sister’s third as well. Over the years, Yvonne and Claude added to Thivin’s holdings with other land purchases, but the couple never bore children. Yvonne outlived her husband, and upon her death in 1987 the sisters’ original two-thirds inheritance reverted to Paul Jambon of the Jambon-Chanrion family, along with fifty percent of the land Yvonne and Claude had purchased over the course of their marriage. The remainder of the Thivin holdings went to Claude’s great nephew, also named Claude. Nephew Claude further inherited vineyards from his immediate family, enabling him to maintain Thivin’s volume. The Art Deco wine label, created in the 1930s, was a product of that marriage. After Yvonne’s death and the restoration of the Chavannes vineyards, this label became joint property, and now it is used by both domains under their respective names. Today Pavillon du Chavannes is managed with a lot of love by Paul and Betty Jambon. 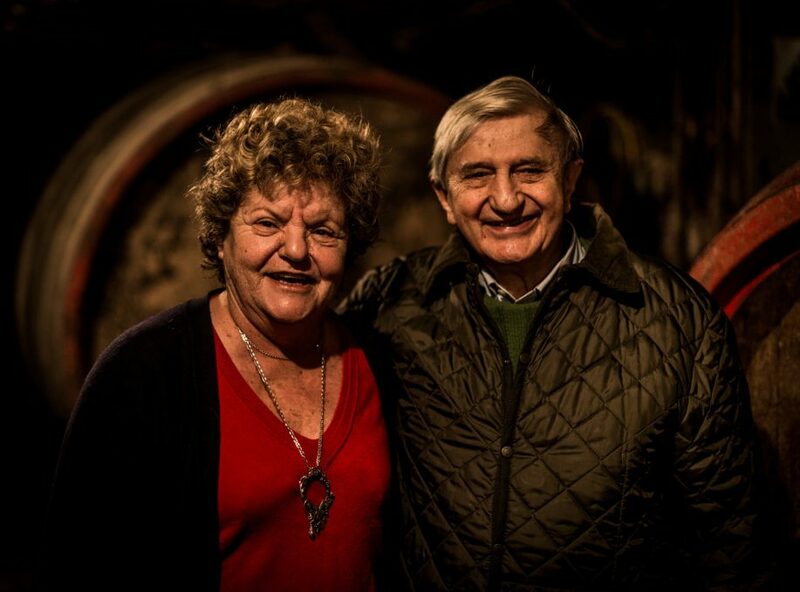 They farm 37 prime acres on Mont Brouilly and make two cuvées from separate vineyards. 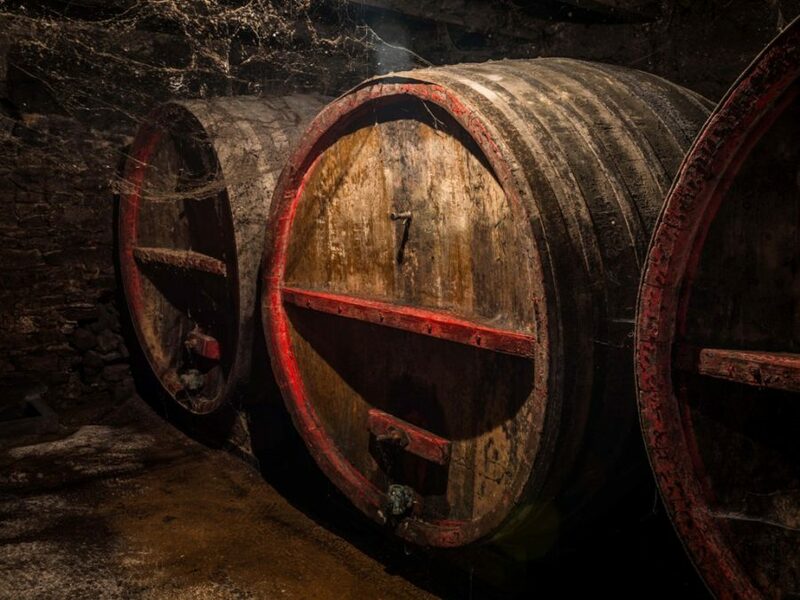 The top wine, Ambassades, comes from 12 acres of Paul’s best parcels, and is purchased by the Quai d’Orsay for use in French embassies around the world. It is the last to be bottled and it is the most age-worthy. Thanks to Jeff Bramwell for the second and third photos above. Gamay This is a very old school Beaujolais in the best sense: beautiful garnet color, beguiling aromatics, and a burst of refreshment in the mouth—and that burst is a savory, mineral, toothsome thing because of the domain’s high elevations and because of Mont Brouilly’s blue granite. Some crus emphasize soil notes, others give fruit, but only good Côte de Brouilly gives stone in the flavor.